Intimidation Clothing is pleased to announce its sponsorship of the upcoming NAAFS: Rock N Rumble 8 event, which takes place on October 4th in Canton, Ohio. Intimidation has long been a sponsor of NAAFS, which continues to be one of the best organizations in the state of Ohio. The event takes place at the Canton Civic Center and is one of the organization’s biggest annual events. The NAAFS has produced many top fighters through its annual amateur tournaments, and many of them will be competing as professionals on this card. In the main event, Cody Stevens (11-7-1) will return to the NAAFS for the first time in more than six years, as he challenges Frank Caraballo (13-7) for the organization’s featherweight title. Stevens never lost the NAAFS title after defeating Donny Walker to win it in 2008, but he has fought all around the world since then. Both fighters have been sponsored by Intimidation in the past. Another pro title will be on the line in the co-main event, as Team Intimidation alum Antonio Castillo Jr. (8-4) challenges Bellator MMA veteran Bryan Goldsby (18-14) for the NAAFS bantamweight title. And another Intimidation alum will also be in action, as Cody Garbrandt (4-0) takes on Charlie Stanford (5-2) in a highly anticipated 135-pound matchup. Intimidation sponsored StrongStyle heavyweight “Big” John Hawk (9-5, pictured left) is also back in action, as he’ll face Bobby Brents (14-4). Multiple other Intimidation alums are also on the card, including undefeated pro Wes Hanson (3-0), pro debutante Jeff Hughes (0-0), and more. Intimidation will also be on hand with an official booth selling its popular brand of t-shirts, hats, hoodies, fight shorts, and more. Intimidation Clothing is a fast-growing Ohio based MMA clothing brand with a growing national presence and over 50 authorized dealers across the USA. Known as the biggest supporter of local MMA, the Intimidation brand is also regularly featured on multiple sporting events on SpikeTV, AXS TV, SportsTime Ohio, MTV2, FUEL TV, The Comcast Network, Comcast SportsNet and EpixHD as well as MMA highlight shows on Spike TV, AXS TV and more. In addition to over 110 styles of high-quality, bold t-shirts and sweatshirts for men, women and children and is also known for their premium-quality EliteFighter MMA board shorts. Anyone interested in becoming a dealer can apply to sell the Intimidation brand as a dealer and they can be found for sale online at IntimidationClothing.com. Fans can also follow the marketing wing of the Intimidation brand, Intimidation Interactive Media, @IntimidationIM, like Intimidation Clothing on Facebook or follow @IntimidationMMA on Twitter. Intimidation Clothing is pleased to announce the addition of two new dealers to its growing list of retailers across the country, as MMA Fit Club in Indianapolis and MMA-WRESTLING CASTILLO JR. TRAINED in Canton have joined Team Intimidation. These two new great Midwest additions join over 50 other outlets across the country and around the world where fans can purchase Intimidation gear. MMA Fit Club is located in the Washington Square Mall in Indianapolis, Indiana, and will add more visibility to the Intimidation brand with its unique location inside a bustling mall. With more than 20 active MMA fighters, the gym is quickly becoming a standout on the growing Indiana scene where the Intimidation brand is firmly entrenched. As an affiliate of Eddie Bravo’s 10th Planet Jiu-Jitsu, the gym offers well-rounded classes including jiu-jitsu, MMA, boxing, zumba, and more. Intimidation Clothing has been growing the name in the Hoosier state over the past year plus sponsoring a variety of MMA events from Art of War Fights, Colosseum Combat, HookNShoot, the Midwest Fight Series, Rocktagon MMA and more. MMA-WRESTLING CASTILLO JR. TRAINED is the newest gym in Northeast Ohio, run by Team Intimidation sponsored professional MMA fighter Antonio Castillo Jr. The NAAFS veteran has started the area’s only year-round wrestling camp, and says he wants the new gym to be known as a “year-round wrestling camp with MMA training.” Soon to be a division of USA Wrestling, the gym is set to stand out as a unique new venture in the Canton area. Intimidation is pleased to have these two new dealers on board heading into the busy holiday season and there is still time to apply to become an Intimidation dealer. For more information, contact Intimidation Clothing and ask about our new holiday sales program. Intimidation Clothing once again had a very busy weekend, as the summer months have set a new standard for the brand. August has been one of the best in company history, and along with providing record numbers in sales, Intimidation continues to sponsor the many of the top fighters and MMA promotions in the Midwest. As the brand featured crews at events in Indiana, Michigan and multiple events in Ohio, it was the Intimidation sponsored pros that did the hard work at events across the nation. Intimidation was live on hand at NAAFS: Rock N Rumble 7 in Cleveland, Ohio, with multiple fighters sponsored on the card. Most notably, featherweight Antonio Castillo Jr. (8-4, pictured left) earned a 145-pound title shot with his second round submission over Brett Ewing (4-4). John Hawk (8-5) also put on a Fight of the Night performance in the night’s main event, although he came up just short of victory by losing a decision. Near Pittsburgh, Intimidation sponsored fighters Shane Chojnacki (3-0) and Anthony Durnell (10-2) took home victories in the main and co-main events, with both fighters receiving great fights from tough opponents. Chojnacki competed for Pinnacle Fighting Championships in his hometown of the Steel City for the first time, and the Fight Club Pittsburgh product earned a second round submission over previously unbeaten foe Reggie Parks (2-1). Durnell put on a Fight of the Night performance against Amran Aliyev (3-3) in the co-headliner, and announced that he has signed a developmental deal with Bellator MMA, where he will compete in November. Meanwhile, at IT Fight Series 22 in Findlay, Ohio, Intimidation sponsored fighter Robbie “The Machine” Michaels (1-0, pictured right) was successful in his pro debut, as he took home a unanimous decision win over Chad Kelly (0-1). Michaels is now 6-0 overall after finishing off a 5-0 amateur career earlier this year. Finally, in action at MMA events in Indiana and Idaho Carson Gainey and Chuck Fordyce both came up short of their goal for the weekend while supported by the Intimidation brand. Castillo photo courtesy of Hexlinc Photography. Intimidation Clothing is pleased to announce its sponsorship of fast-rising featherweight Antonio “The Mexican Muscle” Castillo in his upcoming bout on August 24. Castillo (6-4) will seek his 3rd consecutive win as he is set to take on Brett Ewing (4-3) in a featured pro bout at NAAFS: Rock N Rumble 7 in Cleveland, Ohio. Originally from Northwest Ohio, “The Mexican Muscle” has since transitioned to Northeast Ohio, where he trains at Victory Martial Arts and is a member of the Instigator Fight Team. Also a regular training in Chicago at the Midwest Training Center, Castillo will represent both fight teams for the first time in this bout. A former NAAFS featherweight title challenger, Castillo comes in looking to extend the momentum that he started with a victory over Bobby Emmons in the main event at NAAFS: Caged Fury 20 in November 2012 and then continued with a dominant performance against Anthony Morgan in March 2013. He has won 4 of his last 5, with his only loss coming to current NAAFS featherweight champion Frank Caraballo in their title match-up last June. Throughout his pro MMA career Castillo has fought 3 times for the Toledo based PurgatoryFS promotion and 6 times for the Canton based NAAFS promotion. Intimidation Clothing is a long time supporter of Castillo and a title sponsor of all NAAFS events while also now sponsoring Purgatory boxing & MMA events. Along with sponsoring Castillo, Intimidation will also serve as a title sponsor of NAAFS: Rock N Rumble 7 and will sponsor pros John Hawk and Josh Stansbury, along with several amateur fighters. Intimidation will also be in attendance selling its popular t-shirts, hats, fight shorts, and signature shirts and the company will sponsor multiple amateur fighters on the night’s preliminary card. Intimidation Clothing is pleased to announce its sponsorship of NAAFS light heavyweight champion Josh “The Sandman” Stansbury in his upcoming title defense on August 24th. Stansbury (4-2) is set to defend his 205-pound title in a featured pro bout against John Hawk (8-4) at NAAFS: Rock ‘N Rumble 7 in Cleveland, Ohio. A longtime member of the Ohio MMA scene, Stansbury won the NAAFS light heavyweight title with a first round submission over Dan Spohn at Bellator 71 last year. Also 3-0 as a pro boxer, Stansbury has won his last 4 MMA bouts in the first round, including 3 via guillotine submission. His only two losses as a pro are to Spohn in their first meeting, and Hawk, who defeated him via rear naked choke in the respective pro debut for both fighters in 2009. A product of Team Impact in East Liverpool, Ohio, Stansbury is preparing for his NAAFS title fight with 3-time UFC veteran Branden Hinkle, and he volunteers his free time as an assistant wrestling coach for the East Liverpool junior wrestling program. Along with sponsoring Stansbury, Intimidation will also serve as a title sponsor of NAAFS: Rock ‘N Rumble 7 and will sponsor pros John Hawk and Antonio Castillo Jr., along with several amateur fighters. Intimidation will also be in attendance selling its popular t-shirts, hats, fight shorts, and signature shirts and the company will sponsor multiple amateur fighters on the night’s preliminary card. Intimidation Clothing is a fast-growing brand of lifestyle apparel & MMA training gear with a growing national presence and over 50 authorized dealers across the USA. The Intimidation brand is regularly featured on multiple sporting events on SpikeTV, AXS TV, SportsTime Ohio, MTV2, FUEL TV, The Comcast Network, Comcast SportsNet and EpixHD as well as MMA highlight shows on Spike TV, AXS TV and more. In addition to over 110 styles of high-quality, bold t-shirts and sweatshirts for men, women and children and is also known for their premium-quality EliteFighter MMA board shorts. Anyone gym or store interested in selling the Intimidation brand can contact Intimidation Clothing to become a dealer as all branded products are sold online at IntimidationClothing.com. Fans can also follow the marketing wing of the Intimidation brand, Intimidation Interactive Media, @IntimidationIM, like Intimidation Clothing on Facebook or follow @IntimidationMMA on Twitter. Intimidation Clothing is pleased to announce its title sponsorship of the upcoming NAAFS: Rock ‘N Rumble 7 event on August 24th in Cleveland, Ohio. 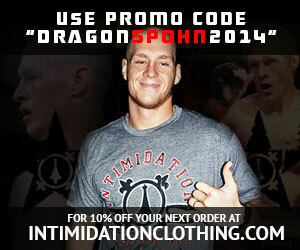 A longtime sponsor of NAAFS events, Intimidation Clothing serves as a title sponsor for each show throughout the year. Annually one of the biggest events in Ohio each year, Rock ‘N Rumble this year features one of the best lineups in its 7-year history. In the main event, two Intimidation sponsored fighters will square off for the NAAFS light heavyweight title, as Josh Stansbury (4-2) will defend his title in a rematch against John Hawk (8-4). Returning to MMA after a 14-month layoff where he went 3-0 in professional boxing, Stansbury receives a shot at retribution against Hawk, who defeated him in the respective pro debuts of both fighters in 2009. Hawk comes in riding a 2-fight winning streak and looks to win his second NAAFS pro title after claiming the heavyweight title in 2010. Also in pro action, Intimidation sponsored featherweight Antonio Castillo Jr. (6-4) will return to the cage for the first time since March. Now splitting his training with the Instigator Fight Team in Canton, Ohio and the Midwest Training Center in Chicago, Illinois, “The Mexican Muscle” will put his 2-fight winning streak on the line when he takes on veteran Brett Ewing (4-3). Intimidation will also sponsor multiple amateur fighters from top local gyms, including GriffonRawl and Evolve MMA. In addition to sponsoring multiple fighters on the card, Intimidation will be on hand selling its popular brand of t-shirts, hats, hoodies, fight shorts, and more. And for the second NAAFS event in a row, Intimidation will unveil a new “Support Local MMA” t-shirt as the brand adds a second men’s style and a women’s version of the new hit tee.